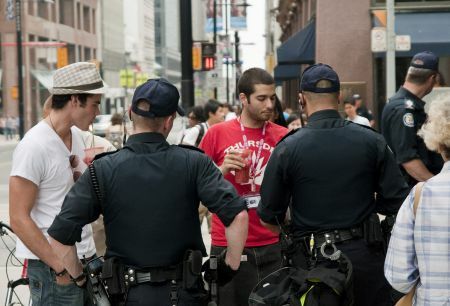 Toronto - Hundreds of illegal detentions and searches have became common place this weekend for everyday Toronto residents and protesters while Alternative Media Centre (AMC) journalists have also been subject to mass illegal searches, detainments, 8 arrests without charge and 1 arrest for breaching the peace. Dozens of AMC journalists have reported illegal searches and detainments by police. Police are not allowed to detain, search or arrest people without a charge (or their consent in the case of a search), unless they are caught commiting a crime or unless the police believe a terrorist activity is taking place. Over 900 arrests have been reported during the G20 Summit making this the largest mass arrest in Canada's history. Many have been arrested without charges and held in small cages crammed with protesters for hours or even days. An AMC journalist was seriously injured when a stun device was used on him while filming an illegal search. The journalist had a pacemaker and was rushed to hospital. Meanwhile, AMC journalists Maxx Lennox and Brianna Chatwin were witnessed being illegally searched while covering events in Downtown Toronto on Sunday. Isaac, a friend with Maxx at the time, recounted that both were walking around the corner at 4:15pm when police saw that Chatwin had a bandana. A Constable, Badge # 10038, confiscated the banada informing her that "We're taking all banadas so you can't put it on," and stated it was "a new order." Chatwin said police did not believe that she was media. Both Chatwin and Lennox say they were also stopped an hour and a half before near College subway station by Toronto Police Services officers who were not wearing badge numbers and refusing to identify themselves. When asking for police identification, Lennox said that police responded "we don't have to respond to your questions" and "protesters took our ID". Police are required to show badge numbers under the law. Chatwin also said that police told her, "If you take my photo, I'll smash your camera." Two other AMC journalists who happened upon Lennox and Chatwin's detainment took photos and repeatedly asked police what grounds they were using to search both journalists as neither had consented to a search. Police told both that they were "blocking the sidewalk" and that if they did not walk away from the illegal detention, they would be arrested for "obstruction of justice". Constables #10430 and #9909 took photos of all the journalists and repeatedly threatened AMC journalists with arrest. All 4 were eventually allowed to leave. Submitted by Toronto Anonymous (non vérifié) on mar, 06/29/2010 - 01:55. Submitted by Gwalgen (non vérifié) on mar, 06/29/2010 - 14:36. Whoops! Thanks for the copy-editing!